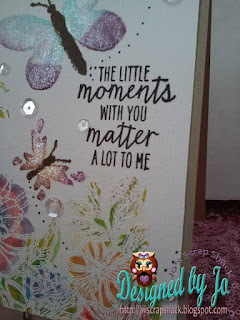 ~Jo's Scrap Shack~: Dies R Us Challenge #51 "Butterflies"
Dies R Us Challenge #51 "Butterflies"
Welcome to a new challenge at Dies R US and I sure hope that your day is going well. This is my first challenge in a couple of weeks, as I was having a lot of health issues. I am happy to once again, be on my way to getting well. So are you excited for another challenge??? This week's challenge requires us to use butterflies on our projects! So here is what I came up with. 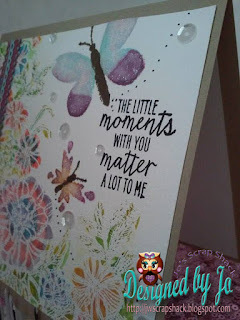 I used "Alison's Ribbons Dies", by "Cheery Lynn Designs" which can be found in the Dies R Us store HERE ... , to create a beautiful border that I will use later on my card. I used the retired Stampin Up stamp called "corner garden" and stamped it in versamark on some Canson watercolor paper. I then heat embossed with some white embossing powder and let it sit a minute. I used my Tim Holtz distress inks in various colors to watercolor in my image. I made sure to dry my image with the heat gun for a minute before wiping away the extra ink laying on top of the embossed image. 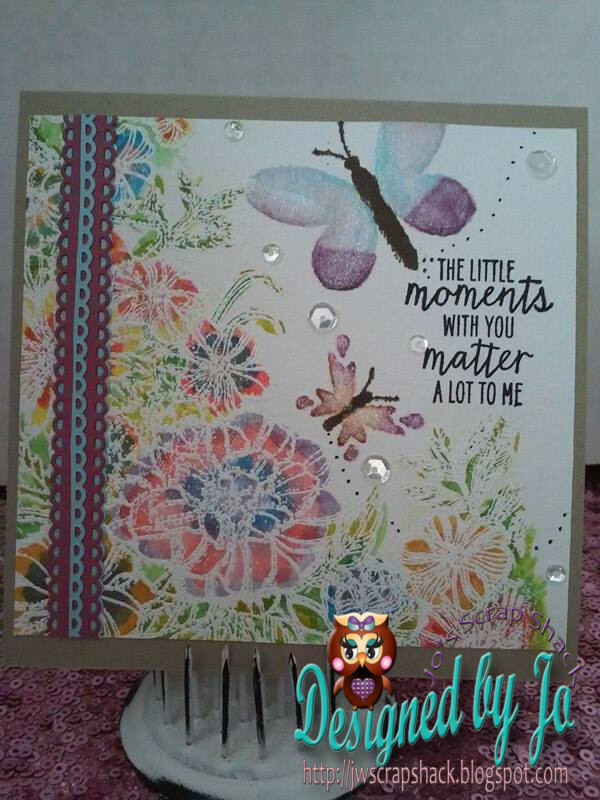 The butterflies and the sentiment came from another Stampin Up stamp set called, "Watercolor Wings". The butterflies were stamped in various distress inks to build up the color I wanted and then I worked the color with a paintbrush and a little bit of water. I added some sparkle to the butterflies and some of the flowers with my Spectrum Noir clear sparkle pen. The sentiment was stamped with Ranger's archival black ink. 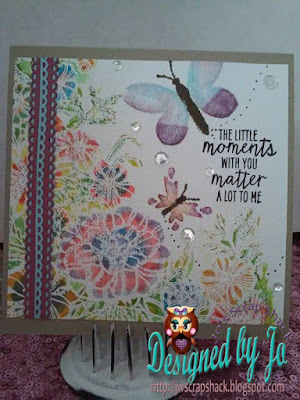 Next I added that beautiful border that I made in the beginning using the "beautiful Alison's Ribbons Dies", to the left side of my card front and then adhered the finished card front to a piece of crumb cake cardstock by Stampin' Up. The card measures 5 inch by 5 inch. I just love the pop of color this gives for a great finishing detail! To finish off my card, I added some trails to the butterflies and added a few sparkling clear sequins in various sizes from Pretty Pink Posh. Here are a couple more photos. Well that is all I have for you today my friends. I appreciate you for taking time out of your day to visit me and see what I am up to. 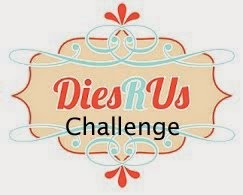 Please don't forget to stop by the Dies R US challenge blog to see what the rest of my design team sisters have created for you today. And make sure to link up your own project too! And for more inspiration, check out the Dies R US Inspiration blog . You will find yourself browsing for awhile. There are so many gorgeous projects that will surely inspire you and get your creative mojo flowing. Thanks again for stopping by! Wow! So pretty! I am glad to hear you are feeling better. Hopefully you will continue to do well, so you can keep creating! Beautiful card Jo!! Love seeing those 'ribbons' used I have been trying to decide if I was going to purchase them or not...have a great day!! This is such a gorgeous card! Well worth all the time it must have taken to create! Love it! Jo your card is BEAUTIFUL! LoVe your sweet butterflies. Thanks for sharing. I'm off to enter my card at Dies R Us. Thanks for the heads up. I'm glad you are feeling better! Your card is lovely, the details just gorgeous! Happy to see you crafting and feeling better.Your card is absolutely beautiful! !I love the gorgeous background, especially the pretty butterflies!!! !